In my Custom Fields, Part 1 post I demonstrated how to create a customized user interface for editing field content in Content Editor. This post is going to cover how to do the same sort of thing for Page Editor. Demonstration of the component described in this post. I know that I promised a custom field render in my previous post, but that's going to have to wait until my next post. This post has more ground to cover than I expected! But that's OK because a custom field renderer isn't needed to create the custom user interface. The generic field renderer is able to handle the user interface we're going to build. They are not very flexible - If new content needs to be added to a custom field type, it can result in a lot of work. The amount of work is hard to justify when you consider how easy it is to add a new field on a data template. In other words, using data templates to define the content is easier than creating and maintaining custom fields. The parts of Sitecore that are needed to create custom field types are not entirely documented. Creating this type of customization is risky because of changes that might be made to the API or to the Sitecore user interface in the future. In my previous post I included name-parsing logic directly in the name field control. If you remember, the purpose of this control was to display a custom interface for editing a name field using Content Editor. In order to avoid any possible confusion regarding the purpose of the various classes being created, rename the control created in the last post to NameControl. Recompile your code. Don't forget to change the control name in the core database, too (/sitecore/system/Field types/Custom Field Types/Name Field). This is a good point to test your changes. Recompile your code and make sure everything works as it did before you started reading this post. No new functionality has been added to Sitecore yes, so your code should work the same as it did before. The Sitecore client user interface is built using XAML. This technology allows user interface components to be defined using XML. An XML Layout can be used to define the user interface. In the top menu, select File --New. The New File window appears. Select XML Layout from the Layouts category. The new file wizard appears. For the name enter "Name Field Editor Layout". Then click the Next button. For the location select the \Layouts\Dialogs node. Click the Next button. For the file location select the \Website\layouts node. Click the Create button. The newly created XAML file appears in Developer Center. This file can be edited using Developer Center, or by editing the file Test Field Editor Layout.xml directly from the file system. The XML file created in the previous step must have controls in order to display a meaningful user interface. NameFieldEditorLayout - If you look in the core database you can find the item that was generated when you used Developer Center to create a new XML layout: /sitecore/layout/Layouts/Dialogs/Name Field Editor Layout. One of the properties of this item is its control name: NameFieldEditorLayout. This value was automatically generated by Developer Center. When Sitecore uses the XML layout, it is going to look for the XAML file that has the definition of NameFieldEditorLayout. By containing the tag NameFieldEditorLayout, this file becomes the file Sitecore will use. FormDialog - Creates a modal window. GridPanel - Creates a 2-column table. Each control inside the GridPanel tag gets its own cell. The 1st control gets the 1st cell in the 1st column. The 2nd control gets the 2nd cell in the 1st column. The 3rd control gets the 1st cell in the 2nd column. The 4th control gets the 2nd cell in the 2nd column. CodeBeside - Defines the file that will contain code like event handlers. OnLoad - This code runs when the dialog window is loaded. Specifically, the code sets the values of the FirstName and LastName input fields to be the current field value. This is done by reading a query string value. The query string value is set by code I will write in a later step. OnOK - This code runs when the OK button is clicked. Specifically, the code passes the values in the FirstName and LastName input fields back to the code that opened the dialog window in the first place. That, also, is code that I will write in a later step. //instance that opened the dialog. //WebEditCommand class that caused this dialog to appear. Open the Presentation Details for the item created in the previous step. Set the layout to be Layouts/Dialogs/Name Field Editor Layout. The class identified in the previous step contains the logic that is run when the specified command is executed (meaning when the edit name button is clicked). Execute - This method reads the current name field value. It sets this value as a parameter, which is important because this will make the value available inside the Run() method. Then the method calls the Run() method. Run - If the code is running during a PostBack it means either the Cancel or the OK button was clicked. If the Cancel button was clicked (there is no result, so args.HasResult is false) there is nothing else to do so the method returns. If the OK button was clicked, the XML generated by NameFieldEditor.OnOK() is parsed and the first and last names are set for the field in Page Editor. If the code is not running during a PostBack, that means someone has clicked the edit name button. 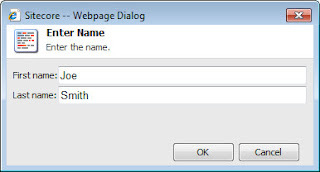 The name field editor dialog window is displayed, and the current field value must be passed to the window. //from the page editor rather than the item itself. //Read the first and last names from the returned XML. //store the values until the user clicks the save button. Note: in order to compile this code, you may need to add a reference to the Sitecore.Client.dll assembly. If using Visual Studio because to set CopyLocal to false. After I compile my code I am ready to test it. I need to make sure I have a field in a data template that uses the Name Field type. In the sublayout (or rendering) you're using to display the field value, make sure you're using the field renderer to display the value. You should be able to go into page editor and click the Edit Name button. And when I click the button, I see the name field editor. In my next post I will demonstrate how to create a custom field renderer. Also, when you use the default field renderer on a name field, you may notice there is some unwanted functionality. I'll tell you what it is in my next post - along with a solutions for it. In the meantime, here's a hint: is there any way for a Page Editor user to circumvent the name field editor interface? Writing My First XAML Application - Great tutorial that guides you through every step in creating a XAML application. Alexey Rusakov's blog - Alexey has written a number of outstanding posts on this subject, and has tagged them for your convenience. The challenges stated at the beginning of the post generally steer me towards item editors and the iframe field type rather than custom fields, I think these two approaches are easier to implement than custom field types and less likely to suffer from those risks. The Client Configuration Cookbook covers those topics.